Put vermicelli only into 2 bowl (600 cc) of boiling water, cook for about 2 minutes, stir well with chopsticks. Shut down the heat, add with soup and sauce sachet, ready to serve. Allergen Information: Contains Soya Bean, Crustacean (Shrimp). Ingredients: Vermicelli: Green Bean, Pea, Water. 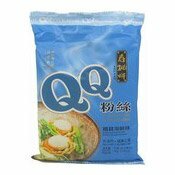 Soup Sachet: Salt, Sugar, Flavour Enhancer (E621), Seafood Powder, Scallop Flavour & Flavouring, Hydrolysed Vegetable Protein, Pepper Powder, Dehydrated Chive. Sauce Sachet: Palm Oil, Shallot,Salt, Prawn Flavour & Flavouring, Flavour Enhancer (E621), Spices.